As Bhutan specialists, we don’t just “do” Bhutan. We live and breathe Bhutan, and want you to experience the Bhutan we know and love. We are obsessed with giving our travelers amazing experiences. There is a reason our clients come back again and again and again. Our clients have a lot to say about their experiences with us. And they say it better than we can. We have have had the opportunity to travel since the 1960’s through out the world. Being interested in world history, we have been on all seven continents and always try to experience the local culture as well as get to know the people. We have experienced North America as well as Europe, Australia and New Zealand, Africa, Asia, the mid East, South America, Mexico, Antarctica and always try local customs. For example, we have camped in the Sahara, trekked to Mt. Everest, did a dig in Israel, climbed the pyramids, summited Kilimanjaro, hiked the Inca trail, camped with the Masai people, have seen the reindeer people in Mongolia, swam with the sharks in Bora Bora to name a few. In all our travels, our favorite is Bhutan, for its natural beauty and wonderful people. 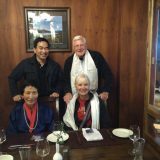 Our experience with Bhutan Lhayul Tours and Travel was outstanding. Their attention to detail, and knowledge of how to enhance your travel experience is second to none! 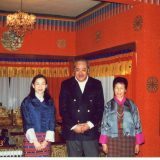 We highly recommend Jigme and his travel team professionals to give every traveler to Bhutan the gift of being their favored guest! For the experience of a life time, you must see Bhutan. On behalf of my very talented yoga teacher and dear travelling companion Yogeswari, and myself, we would like to thank you all at Lhayul Tours and Travels team so much for all you’ll have done both this time and on the previous occasion when we visited Bhutan for the first time. We were a mixed group of 12 people ( worldwide) making a travelling Yoga Retreat from Paro to Bumthang and back. 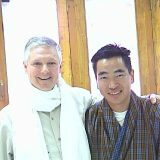 Thanks to the Bhutan Lhayul Tours & Travels Team efforts, we experienced fantastic highlights throughout our 14 day tour. All requests or even what was only a suggestion and seemed totally impossible, were of course immediately made possible by them. Bhutan is much too wonderful a country and Tshering with all your care and everything else it’s been an absolute pleasure. Bhutan LhaYul Tours is the best for independent travel to Bhutan. They created a custom itinerary and took care of me better than the others could have. 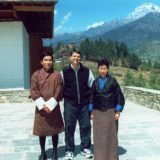 If you’re a well-traveled person, and want to go to Bhutan, contact Bhutan Lhayul Tours and Travels.